This workshop takes place in my shady backyard in Carmichael, CA (Sacramento) under 3 canopies devoted to mosaic-making. 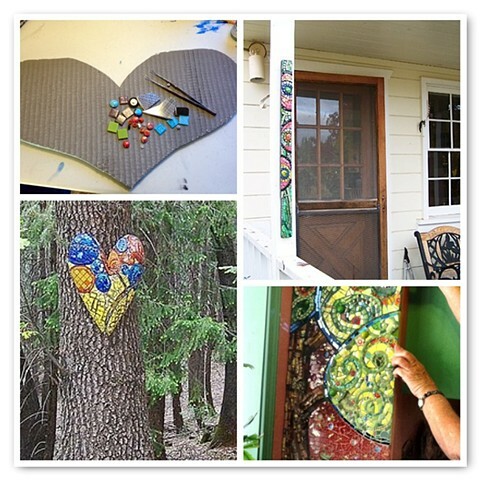 In this one-day workshop you will make a substrate that is weatherproof so that you can mosaic it later to hang outside. You will have an 18" square piece of backerboard to do what you want with it: make one large substrate or several small ones. You will learn easy ways to cut the board into curved shapes like rounds, suns, fish, mushrooms, butterflies, etc. Next, you'll finish the edges, rig for hanging, and transfer a design to the surface. You will receive purchasing information for all materials used in class so you can create more substrates on your own. Note: While there will be some discussion about tesserae (ceramic and glass tiles, etc), this class does not include time or materials for that. If you want to learn more about exterior-grade mosaic tesserae, please take Yard Art 2: Tesserae. To register send me an email at susan@scmosaics.com.